There are two huge risks that beginning investors need to consider, as they are wealth killers. The Internet of Things (IoT) is one of the most fascinating and promising technological movements of our time. Pretty soon, all of our connected devices will be talking to one another, fundamentally changing what our everyday life looks like. Given this trend, you'd think that investing in pure-play companies at the forefront of this revolution would be a lucrative endeavor. But I simply don't think that will be the case. My cases in point for today are InvenSense (NYSE:INVN), Sierra Wireless (NASDAQ:SWIR), and CalAmp (NASDAQ:CAMP). Since the start of 2015, these three have proven to be losing investments. But I have two reasons -- which are somewhat related -- to believe the worst may be yet to come. There's nothing that can drive a business' bottom line -- and its stock -- down quite like having its primary product commoditized. If you're new to investing, think of it like this: You live in a world where apples don't exist. Then, somehow, you're able to start growing them. People love them; they can't get enough of them, and they're willing to pay upwards of $100 per pound for them! Then, someone else suddenly figures out how to grow a slightly different apple. All of a sudden, your customers are only willing to pay $50 per pound. Before long, others have developed their own apples, and they offer them for less. The most you can get for your apples now is $5 per pound. In the blink of an eye, your volume of apple sales has remained the same, but revenue dropped has 95%. That's commoditization. For IoT companies, I fear the same risks. Granted, I'm not a technology expert. But what InvenSense, Sierra Wireless, and CalAmp do is develop technologies that allow machines to talk to one another. Obviously, this is a huge and growing field, and they are three of the first entrants into it. That gave them an advantage...for a while. The problem is that these companies can become victims of their own success. 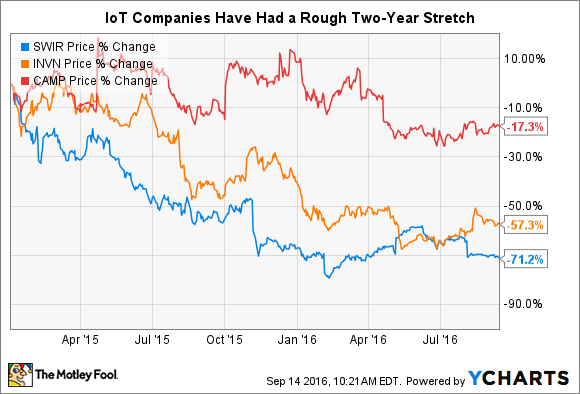 As soon as bigger businesses start to notice that these three are making money on IoT applications, they will want a piece of the pie as well. That's what's happening right now, as General Electric, Intel, Qualcomm, and STMicroelectronics all have or will soon have products on the market that can compete with InvenSense, Sierra Wireless, and/or CalAmp. Bulls will argue that the services offered don't overlap perfectly with what the larger players are coming to market with; or they may argue that the three smaller companies are trying to create ecosystems that would prevent commoditization. These investors have a point, but I think it misses the bigger picture: over the long run, the most lucrative IoT offerings can and will be commoditized, and while attempts at creating an ecosystem are laudable, there's little evidence that they are coming to fruition. Let's go back to my apples comparison. After adjusting to the new reality of only being able to sell apples for $5 per pound, you make your life easier when you find one customer -- a major grocery store -- to buy up over 30% of your product. True, for the time being, it does make your life easier. But it also makes you more vulnerable. All it would take is one person at one company making one decision to find a different producer of apples for you to suffer a 30% dip in revenue over night. In the investing world, this is called "concentration risk," and all three of these companies are exposed to it right now. Previously, CalAmp had two business segments: satellite and DataCom. The satellite business only had one major customer: EchoStar. When EchoStar announced it was essentially cutting ties with CalAmp, it forced the company to shut down its satellite division entirely. And while the DataCom business is growing nicely, the fact remains that it has only one customer that accounts for 15% of accounts receivable, and two suppliers that account for 72% of accounts payable. In other words, 15% of the company's revenue could disappear overnight, and if manufacturing trouble occurs at one of two companies that provide parts for CalAmp, the company could be in a world of hurt. For InvenSense, it's easy to see where the concentration risk comes from. In 2015, Apple accounted for 40% of net revenue, while Samsung provided another 16%. In the case of Sierra Wireless, there's no identifiable customer that accounts for an outsized portion of sales. But the fact remains that in 2015, original equipment manufacturers (OEMs) accounted for 86% of all sales. That's important, because OEMs will almost always pick the cheapest, good-enough technology to put in their products. That makes Sierra very vulnerable to commoditization. I'll be the first to admit that I don't have a crystal ball. It's entirely possible that any one of these companies could produce outstanding returns for investors. All three are doing everything they can to avoid commoditization and diversify their revenue streams. But at their current levels, I have very little confidence that that will happen. Why take the risk when there are so many other companies to invest in that don't face these challenges?